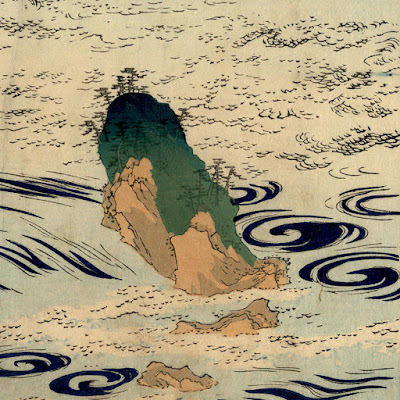 “Awa-no Naruto” or “Awa naruto shinkei” (True View of the Whirlpools of Awa), 1859 (the year of the sheep), from the series, “One Hundred Views of Famous Places in the Provinces” (Shokoku meisho hyakkei) (諸国名所百景　阿波鳴門真景), published by Uoya Eikichi. Colour woodblock print (nishiki-e) with margins (as published). Condition: a richly coloured (i.e. 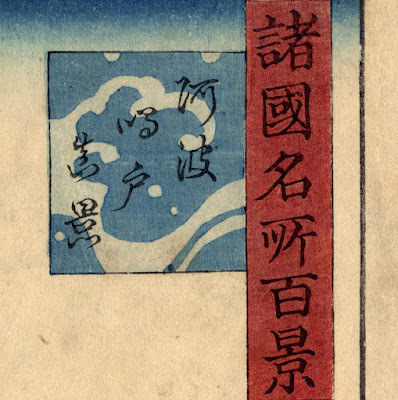 not faded), crisp and well-printed impression in a good condition (i.e. there are no tears, holes, significant stains or foxing) but with signs of use in the margins and a light vertical fold (?) in the centre of the print. 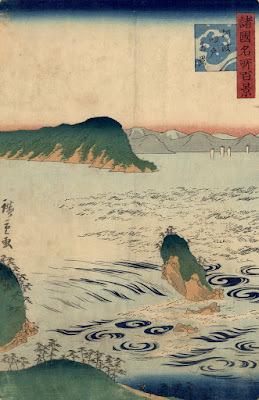 I am selling this rare woodblock print expressing in a graphic way the strength of whirlpool currents on the surface of water and even those below the surface using only line, for AU$368 (currently US$272.81/EUR245.79/GBP211.12 at the time of this listing) including postage and handling to anywhere in the world. 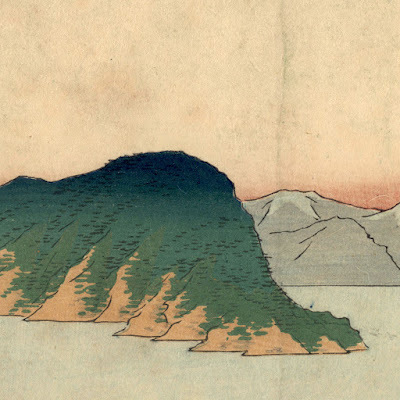 If you are interested in purchasing this genuine woodblock print by one of the great masters, please contact me (oz_jim@printsandprinciples.com) and I will send you a PayPal invoice to make the payment easy. 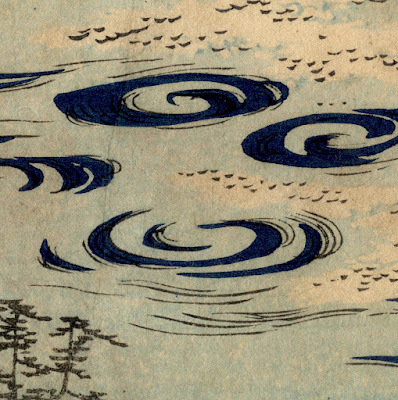 Whirlpools reveal natural forces in landscape and Japanese artists were drawn to them. For example, in a very early post I showcased a three-panel woodblock print (see http://www.harvardartmuseums.org/art/199450) by Andō Hiroshige (安藤 広重;=) (1797–1858) featuring the same whirlpools of the Naruto Straits as shown here in this single vertical print by his son-in-law, Utagawa Hiroshige II (1826–69). 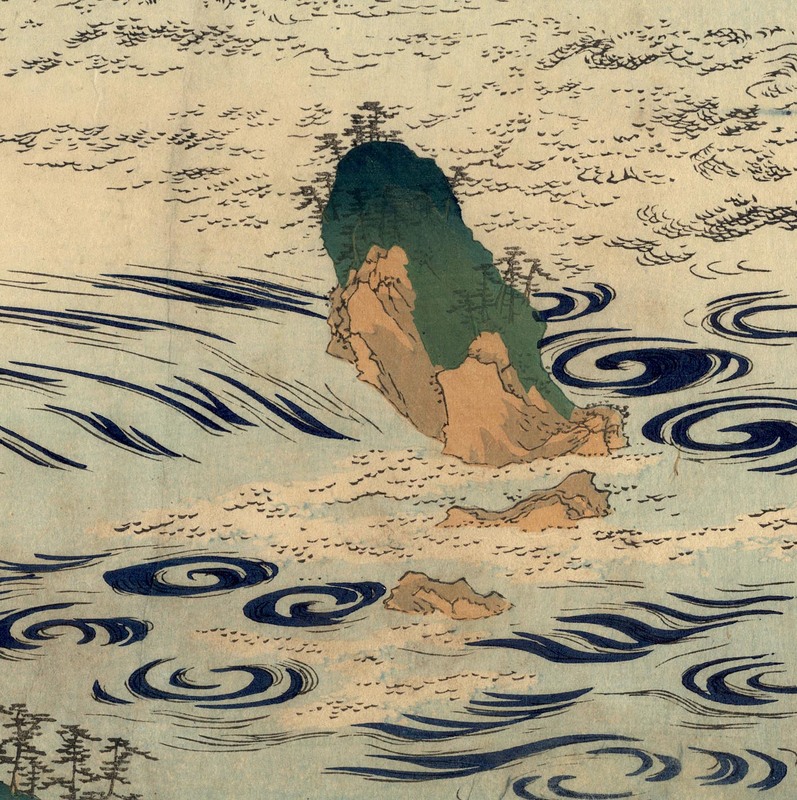 To my eyes there is an interesting difference in the way that the two famous woodblock artists perceived the swirling waters. I see Andō Hiroshige’s triptych version as a grand vista of the whirlpools with the focus being on the churning surface of the water and the spreading pattern of foam-lipped eddies. 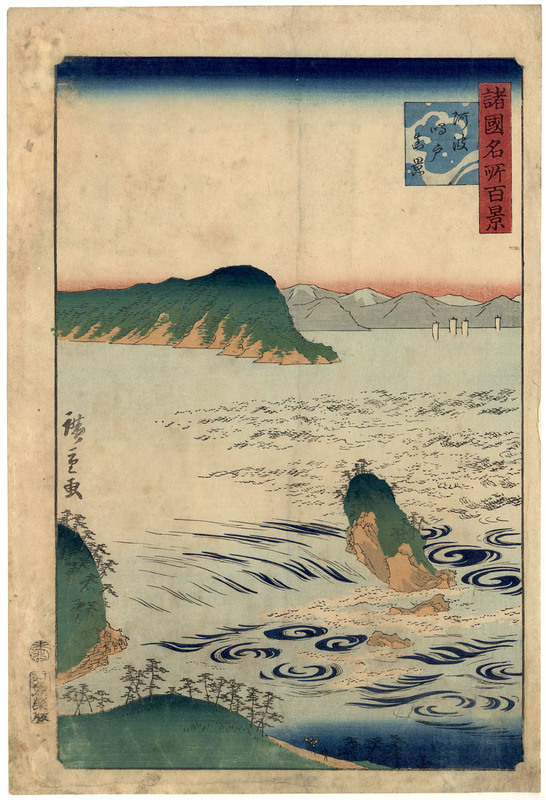 Utagawa Hiroshige II also shows the spiralling ripples of the whirlpools, but, unlike his father-in-law, here the expression water currents seems more about the energy below the surface than what is seen above. From a very personal reading of this scene, I also feel that the cropped sections of headland and the landforms in the foreground are portrayed as physical solids around which the waters flow. Or to explain this reading slightly differently, Utagawa Hiroshige II presents this landscape as if it were made of opposing forces: the yin and the yang.